The Bubonic Plague bacterium is commonly transmitted from rodent to human by the oriental rat flea, Xenopsylla cheopis (Figure 1). The flea is a rodent parasite and human infection is accidental. Figure 1. Transmission of the Bubonic Plague bacteria. From 11000 to 24000 unencapsulated bacteria are regurgitated from the flea's midgut. Because of its low body temperature, the bacillus is unable to develop a capsule within the flea. The body temperature of the flea is approximately 27°C, whereas the human body temperature is 37°C - a more desirable environment. The plague is caused by Yersinia pestis, a Gram-negative bacillus, belonging to the family Enterobacteriaceae. Y. pestis is a non-spore-forming, facultative anaerobe. They are the only species of Yersinia that are non-motile at room temperature. In addition, Y. pestis is catalase-positive, oxidase-negative, urease-negative, and indole-negative (Figure 2). Figure 2. 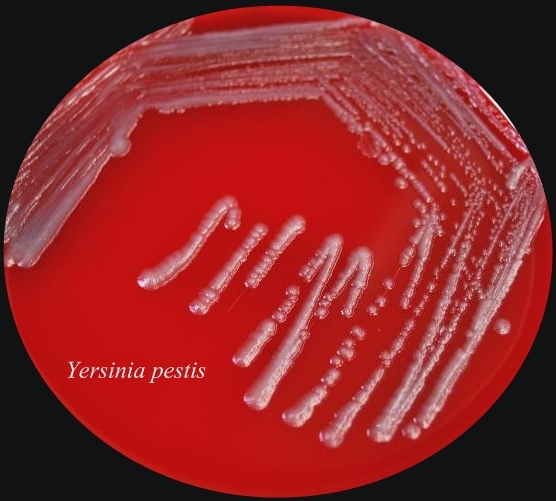 Sheep blood agar plate of Yersinia pestis bacteria. This was the appearance of the colonial growth after 96 hours of incubation at 25ºC. Virulence and Pathogenicity: The virulence factors of Y. pestis are encoded by bacterial plasmids (pCD1), rather than by the bacterial DNA. It also hosts two other plasmid which are not carried by other Yersinia species, namely: pPCP1 and pMT1. pMT1 codes for phospholipase D: this is important for the ability of Y. pestis to be transmitted by fleas. pPCP1 codes for a protease, PIa, which activates plasminogen in human hosts and is an important virulence factor for pneumonic plague. pPCP1 and pMT1 along with a pathogenicity island called HPI, encode several proteins for Y. pestis pathogenesis. These virulence factors are required for bacterial adhesion and injection of proteins into the host cell, injection of bacteria into the host cell, and acquisition and binding of iron harvested from red blood cells. The unencapsulated bacilli are phagocytosed. Those that are phagocytosed by neutrophils are killed, but those phagocytosed by macrophages are protected from destruction. The protected bacilli multiply within macrophages. The main goal of this bacteria is to block the macrophages ability to produce pro-inflammatory cytokines (like TNFα). After three to five hours at 37°C, the bacilli produce the F-1 capsular protein (See Vaccination) . The anti-phagocytotic capsule prevents further phagocytosis. Bacteria then spread to regional lymph nodes. Here they continue to rapidly multiply, causing swelling. Virulence factors, transcribed from the bacteria plasmids, are translocated to the host cells. These include the V protein and YOPs (Yersinia outer proteins). In fact, Y. pestis has several virulence factors: attachment to host cells occurs via YadA “adhesin”; YadA also inhibits Complement activation. YopJ inhibits macrophage activation and pro-inflammatory cytokine production. YopH inhibits disrupts cytoskeleton and so inhibits phagocytosis (Figure 3). Once infected, cell death soon follows. Bacteria spread to regional lymph nodes. The swollen node is called a bubo, hence the term bubonic plague. Progressive infection spreads to nearly every organ of the body. Without antibiotic treatment, death may result within two to six days. Figure 3. 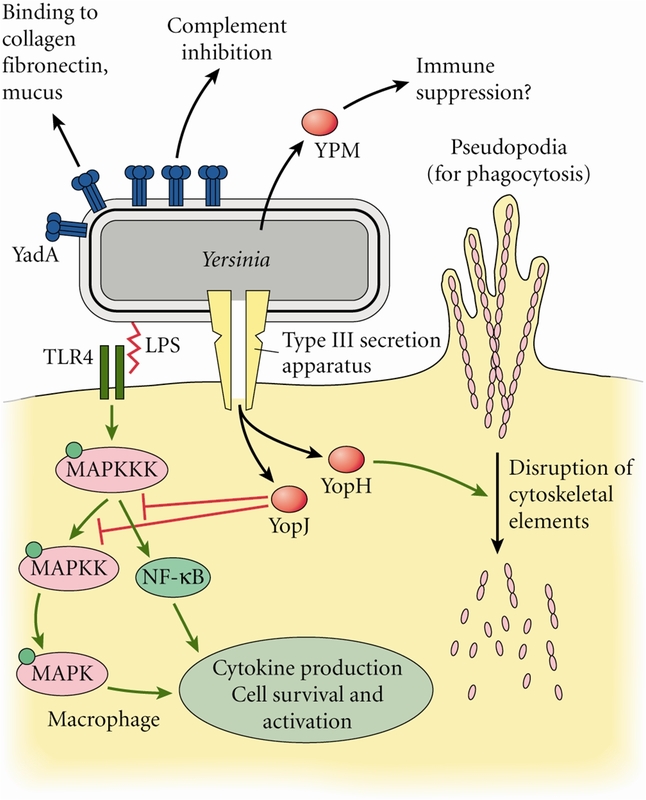 Some of the molecular factors involved in pathogenesis of Yersinia pestis infection. Click to enlarge. Clinical Infections: The three types of infection caused by Y. pestis are bubonic, septicemic, and pneumonic plague. Control: Diagnosis must be made quickly due to fast progression of the disease and the high mortality rate. (2) Avoiding direct contact with sick or dead rodents and their nests. (6) Using insect repellants containing N,N-diethyl-m-toluamide on skin when Y. pestis is detected. Vaccination: The Fraction 1 (F-1) capsular antigen is the most immunogenic fraction in a Y. pestis bacilli preparation. Thus, a surface antigen is an excellent plague vaccine strategy. Early F-1 vaccine preparations induced antibodies and conferred protection. But while initial inoculations gave minimal side effects, booster inoculations produced sever hypersensitivity reactions (allergic reactions). This may have been due to other cell contaminants within the vaccine preparation. Therefore, the early F-1 vaccine, difficult and expensive to prepare, was discontinued. A new vaccine preparation, consisting of genetically engineered F-1 and V proteins, is now under development. It promises to be the most effective to date, producing minimal side-effects.